Michelle's practice focuses on general commercial real estate and financing transactions. She has represented clients in Pennsylvania and throughout the country in matters involving complex commercial real estate acquisitions and sales, commercial real estate financing, commercial leasing, real estate tax exemptions and abatements and general corporate transactions. Michelle has also represented clients in matters involving all aspects of the hospitality industry and in the preparation and negotiation of construction contracts. Prior to joining the firm, Michelle was an associate in the Real Estate Department at Fox Rothschild LLP in Philadelphia. She has also previously served as a law clerk for the United States Attorney's Office in the Organized Crime Drug Enforcement Task Force, and she was a legislative intern for Representative Geraldine Creedon in the Massachusetts House of Representatives. Michelle's experience also includes service as coordinator of fundraising activities for the Appalachia Volunteer Program at Boston College, a program which helps student volunteers work with the rural poor in the Appalachian Mountains. Boston College Law School, Newton, Massachusetts, 1999, J.D. Boston College, Chestnut Hill, Massachusetts, 1996, B.A. Michelle was a co-author of 2005, 2006 and 2007 annual supplements to the Pennsylvania treatise on condemnation law, Snitzer on Eminent Domain, and has co-authored an article entitled "The Appraiser's Role in Predatory Lending" for The Appraiser. Michelle has lectured on commercial leasing topics to small business owners and to participants of various programs at the Women's Business Development Center in Philadelphia. 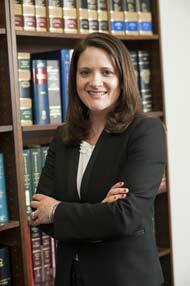 Michelle has represented various clients on a pro bono basis through the Philadelphia Volunteers for the Indigent Program.